From the Utah side, leave Highway 89 at its junction with Franklin Basin Road/FSR-006. This signed junction is located 2.8 miles W of CR-243/Beaver Mountain Ski Area Road and 5.8 miles W of Swan Flat Road/FSR-014 on Highway 89 heading South. 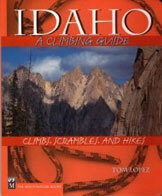 Unlike the access from the Idaho side (see Page 367 of the book), this access does not require 4WD and can be driven by passenger vehicles. At 5.7 miles, the FS road crosses into Idaho and becomes FSR-406. At 7.4 miles, you reach a signed junction with FSR-1212/Corral Hollow Road to the right. This is Corral Hollow. Park here or drive a short distance up the road into the trees, where the road becomes Corral Hollow Trail, an ATV trail (FST-106). This trail ascends to the head of Corral Hollow, where it intersects the Highline ATV Trail (FST-316). Corral Hollow Trail/FST-106 is only marked with a simple FS sign in the ground. There is a nice dispersed campsite 0.8 miles N of the FSR-1212/Corral Hollow Road turnoff on Franklin Basin Road. It is located on the R/E side of the road up in the trees. Thankfully, all of the aforementioned roads and trails are shown on both the NFS map and the Trails Illustrated Logan/Bear River Range map. Unfortunately, the USGS topo map does NOT show the Corral Hollow Road, the Corral Hollow Trail, or the Highline Trail. It is only useful for contour lines and general topography, which IS very helpful when bushwhacking (NFS maps and TI maps lack such topographical detail). If you wish to climb this peak from the Idaho side, drive to the north end of Gibson Basin to find the Highline ATV Trail/FST-316. Hike (or ride an ATV/MC) S then W up FST-316 over the S ridge of Peak 9162 and continue on the trail until it reaches a junction with the Corral Hollow ATV Trail/FST-104 at the head of Corral Hollow. Leave the trail here and follow the route described from that point in the Route section of this commentary. This hike is mostly on trail (Class 1), but has a short section of bushwhacking up the West Face of Peak 9162 to reach the summit (Class 2). From the Corral Hollow Trailhead, follow the ATV Trail/FST-104 all the way up to the head of Corral Hollow, where the trail dead-ends at a junction with the Highline ATV Trail/FST-316. Leave the trail here and bushwhack ENE about 0.3 miles up through thick forest to reach the clogged, forested ridgeline summit that is the high point of Peak 9162. There were no signs of previous ascent on the narrow summit ridge. Same as for the West Face Route. This climb is part of a ridge traverse from Peak 9237 to the south. The route begins at the low point between Peak 9162 and Peak 9237, a wide, long, flat saddle at 8,780 feet. This saddle is a rather unpleasant area of boulders and veg all mixed together. It is tedious to cross. The low point of the saddle is just south of a ridge hump at 8,800 feet (shown on USGS map). From this low point, scramble through the boulders and veg, either skirting the R/E side of, or scrambling up over, the 8,800-foot ridge hump to reach the ridge crossing of the Highline ATV Trail/FST-316. Unfortunately, this trail does not follow the South Ridge; it drops well off the W side of the ridge crest and reaches a junction with the Corral Hollow ATV Trail/FST-104 at the head of Corral Hollow. Cross the ATV trail and continue northward along the ridge crest or just to the R/E of it, to avoid a thick forest/boulder mix on the L/W side of the ridge crest. The terrain is mostly an open mix of veg and boulders, but it is a tedious scramble and will require use of your hands at some points. Speaking of points, you must climb over two more points before reaching the final ridge saddle (at 8,900 feet) underneath the narrowing summit ridge. Bash your way northward up the ridge crest (or just to the R/E of it) in a wickedly thick mix of trees and boulders. You will know this is the summit high point for three reasons. First, there is a distinct open terrain area on the R/E side of the ridge, just above the final saddle. Secondly, the ridge narrows noticeably. Thirdly, the ridge turns L/NW from the summit high point and experiences a noticeable drop to the next saddle. The summit high point is a boulder on the ridge crest amongst the thick line of trees. There were no signs of previous ascent. This summit is a rather unimpressive bump on the ridge with minimal views and no view to the west (which was my planned descent route). Same as for the North Ridge Route of Peak 9237. From the summit of Peak 9162, descend SW (briefly) then W through thick, blowdown strewn forest with lots of veg mixed in. This is a strange face because you must initially CONTOUR westward since the actual West FACE lies just over 0.3 miles away. Just keep going in a westerly direction. Do NOT mistakenly descend southward (an easy mistake to make) or you will end up descending down Corral Hollow, a completely different route from the West Face Route. I guarantee you that your urges will draw you to want to descend Corral Hollow, but DON’T DO IT. Follow your instruments here (i.e., your compass). You must clamber over lots of deadfall and bash through thick brush to eventually reach the top of the West Face of this peak.You will cross the Highline ATV Trail/FST-316 en route to the head of the true West Face (it is not even close to the ridge crest). Once the contouring turns you R/N, you have reached the head of the true West Face. From there, descend due W down to Franklin Basin Road. I saw elk, a moose, and a cow in this forested descent. The forest is thick in some spots but open in others. Overall, the descent is not too awful and it’s not overly steep. But you’ll still be happy to reach the valley floor and Franklin Basin Road. Follow Franklin Basin Road south to either the roadside campsite (as I did) or farther south to Corral Hollow Road and the Corral Hollow trailhead.